Brazil has come up with a unique incentive to help people save water. Banco Cyan, a public utility company in Sao Paolo, has created an on-line bank account system, where customer’s water usage is tracked, and points are given for reduced consumption. These “eco-credits,” can be redeemed for discounts with participating merchants. While we all need to be proactive in saving our natural resources, sometimes a little added incentive can go a long way. When it comes to fashion, how old is too old to carry off the look? A recent article in London’s Daily Mail posed the question to 2000 women, aged 18-65, and the answers were surprising. A whopping 44% of the women polled regularly worry that they are too old to wear certain items of clothing. The group believes that miniskirts should be taboo after age 35, and stilettos should be banned by age 51. Knee-high boots were deemed inappropriate after the age of 47, leather pants at age 34 and tight tops at age 44. The most shocking revelation was perhaps their contention that women should not wear bikinis over the age of 47, and by age 61, swimsuits in general should be avoided completely. Hello, have you ladies not seen Helen Mirren in a bathing suit? Startlingly, body shape was not a factor in their decisions. As a woman of “a certain age” who spends quality time in the gym, working out and eating healthfully, I am offended by the assertion that I may be too old to wear certain of these items. I am equally appalled by the young women who are seriously over weight walking around with rolls of exposed fat oozing over the tops of their jeans, bellies exposed. Is it their right to dress tastelessly because they are young? Only minutes after reading this article, I saw a post on the gossip site Perez Hilton; regarding the inappropriate display of flesh when 13-year-old Disney starlet Bella Thorne was photographed wearing a skimpy bikini on the beach. The 85 comments that followed seemed to agree that she was too young to be flaunting her body, albeit a childlike one, in public. So, if 13 is too young, and 47 is too old, what is the fashion sweet spot? Are we to be relegated to frumpiness just because we are over 40? From the overwhelming response to the article, the answer is clearly and resoundingly, NO! Let your mirror be your guide, and good taste be your barometer for style regardless of your age. Otherwise, when I hit 53, and have to cut off my hair, wear sensible shoes and elastic waist pants, please just shoot me! 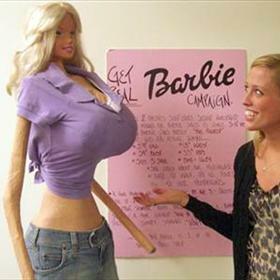 Ever wonder what a Barbie doll would look like if it were life sized? Galia Slayen, a Hamilton University Student, blew up the measurements and constructed a “human sized” replica to demonstrate just how unrealistic that might be. The doll stands 6 feet tall, and has an 18” waist, 33” hips and a 39” bust! A little freaky don’t you think? Slayen, who has battled an eating disorder, created the doll to make a point about what influences negative body issues in young women. While she doesn’t blame Barbie, she does point out how unrealistic expectations of beauty can contribute to insecurities.